Procter and Gamble’s Charmin brand offers bathroom tissue and wipes especially made with comfort and strength in mind; their slogan is “We all go—Enjoy the go!” This line of products was originally made by the Hoberg Paper Company in Green Bay, Wisconsin in the 1920’s, with a female head profile on the wrapper. Supposedly, the name was devised after one of the employees commented the paper was “Charming.” Throughout the 30s and 40s, this product gained popularity, with its emphasis on comfort and dependability. It even advertised that it was great for cold cream removal. In 1957, Procter and Gamble purchased the company, but eliminated the paper napkin, towel, and tissue lines and concentrated only on the bathroom tissue products. One of the most recognizable product spokespersons ever created was Charmin’s Mr. Whipple who proved countless times how “squeezably soft “the tissue was, continually admonishing commercial “customers” to “Don’t squeeze the Charmin!” He was the face of the product for over 20 years, with guest appearances and fan clubs for him across the US. Eventually he was replaced with Charmin babies who proved how the tissue “babies” you skin. The most recent ads feature a cuddly bear family who demonstrate how enjoyable the “Call to Nature” can be. Charmin was the first to offer a 4-roll pack ( 1930s), a 9-roll package (1990s) and proof from experts (Roto Rooters) that the tissue is clog free. 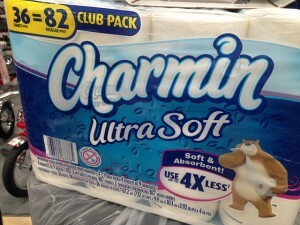 The current line of Charmin products includes UltraSoft (use less), UltraStrong (extra clean), Basic, and Sensitive (with aloe and lotion) toilet tissues, as well as Freshmates (flushable) wet wipes. The company truly believes in making the “go” as enjoyable and pleasant as possible. They even offer a free app (Sit or Squat), which can locate the nearest bathroom!